Product color: Burgundy; supports up to 400 lbs. The Drive Medical Adult Anterior Safety Walker was designed with a unique braking mechanism to not only provide extra safety and stability, but also peace of mind. 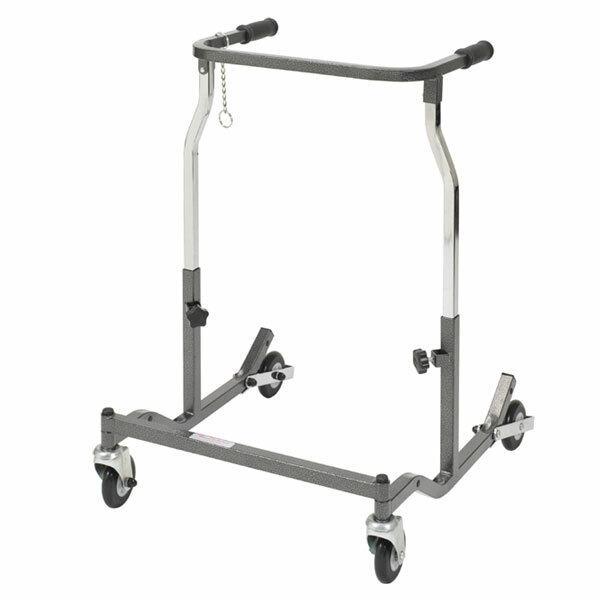 Ideal for patients with limited hand function and/or limited cognizance, the Drive Medical Anterior Safety Walker lets the user simply apply pressure to the handlebar to activate the brakes and stop the wheels from rolling. The Drive Safety Walker also halts in step with the patient and the braking mechanism automatically engages if the user stumbles, making it the perfect mobility solution for people in rehab as well. It is also height adjustable in 1-inch increments with an adjustable handlebar height of 29 to 36 inches, and supports up to 400 lbs. See full product features and specifications below. --Handlebar Height: 29" - 36"
--Supports up to 400 lbs.